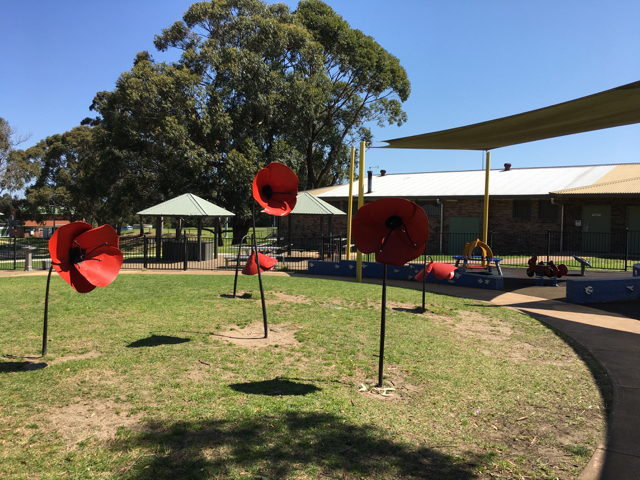 The Forestville War Memorial Playground is located off Melwood Avenue in Forestville right next to the Forestville RSL. It is a great fully fenced playground which suits young and older children. We love the poppies around the grass area to signify remembrance. This playground has shade sails over the little kids area, the baby swings, a picnic bench and the structure with a slide. The structure is great for kids of all ages to climb and to use the slide. There are two swings next to it which are suitable for older children. This playground is great to have a play, a picnic, a little gathering or a birthday party and use the bbq equipment inside and outside of the playground and eat under gazebos with tables and benches. There is a lawn area next to the playground which some people use for sports practice or for birthday activities. There are public toilets next to the playground which have at times been closed on weekends, if that's the case there are toilets at the RSL next door. There is a large free carpark next to the playground.